I felt like John Cleese in "The Meaning of Life" walking up to the entrance of Hollywood's The Grill on The Alley and stating emphatically, "We've come for your liver!" It was not executive chef John Sola's liver I was after (he was using it), but the tender and delicious calf's liver which (according to Sola) is The Grill's signature dish. 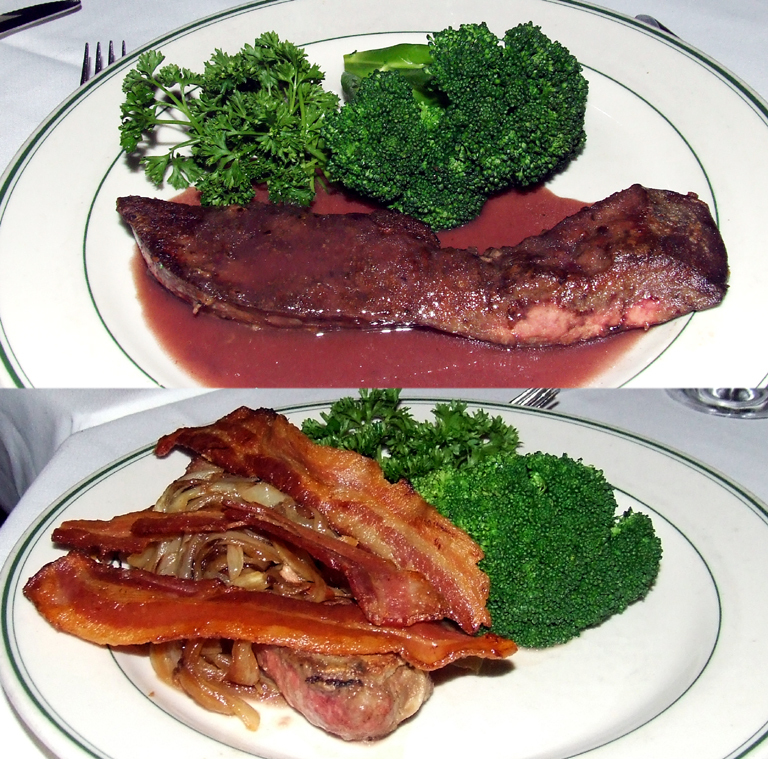 The quandary I was faced with wasn't what I wanted, but how I wanted it prepared - as part of their "Liver Lover's Menu" promotion, the filtering organ is offered two ways: traditional-style with bacon and onions, and with Bordelaise sauce. I don't mind traditional, if we're talking the traditional amphibian dish of Ban Chom, but my mission in life is to go for the unusual, so Bordelaise won. Sola explained that their calf's liver is acquired from Marshal Farms in Pennsylvania, but a search only returned results of other restaurants who get their veal products there, and a place in New York that raises ferrets. Needless to say, the possibility that the calf's liver and ferrets may come from the same place made it all the more intriguing. Prior to the meal, we were treated to hors d'oeuvres (including miniature crab cakes and gravlax) and do-it-yourself martinis. 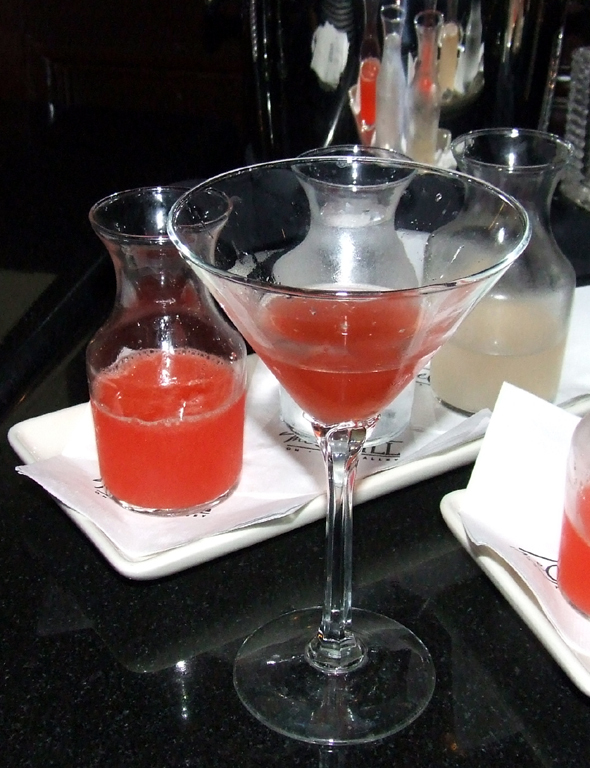 There were three varieties offered: the CEO, featuring Chopin Vodka and extra olives; a blood orange martini with Grey Goose L’Orange, Monin Blood Orange and orange juice; and a lemon drop martini. I had to try the CEO if only for the olives, allowing them to get drunk before eating them; the blood orange martini was on the sweet side but had a nice scent of fresh orange. I found it ironic that I was destroying my own liver prior to eating one. I worked my way through the thick slices of fresh baked bread with sauteed peppers and onions and a fresh endive salad with pecans, romaine lettuce and Gorgonzola cheese in anticipation of the bloody glandular feast. The liver was a sight to behold - in place of the tough, seemingly laser-cut slice of brown chewiness I expected was a thick steak-cut portion of liver, dark brown on the outside and pink and juicy within. 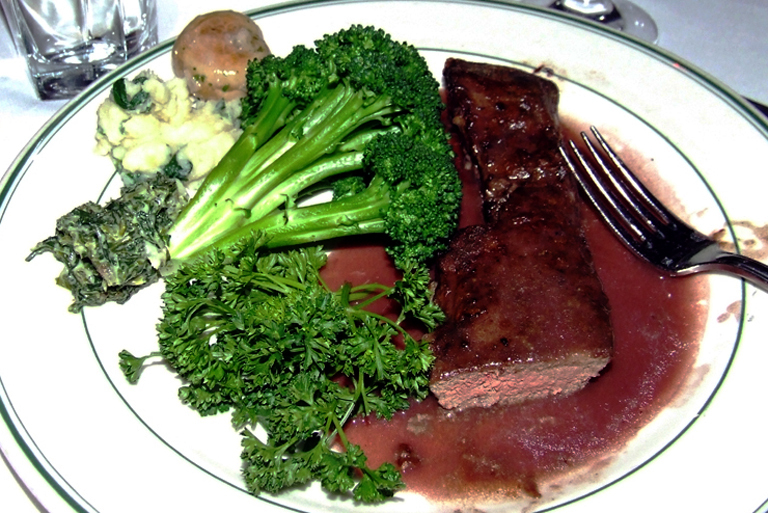 The meat was sitting in a puddle of dark, rich Bordeaux-based Bordelaise sauce in the shade of a felled broccoli tree. The liver was so tender that I didn't really need to use the John Locke knife that was provided; it simply gave itself up to the fork willingly. The notable flavor of liver was present, but it was delicate and the meat metled in my mouth. It was without a doubt the best liver I'd ever eaten (except maybe the census taker's, with fava beans and a nice Chianti - fthfthfthfth!). 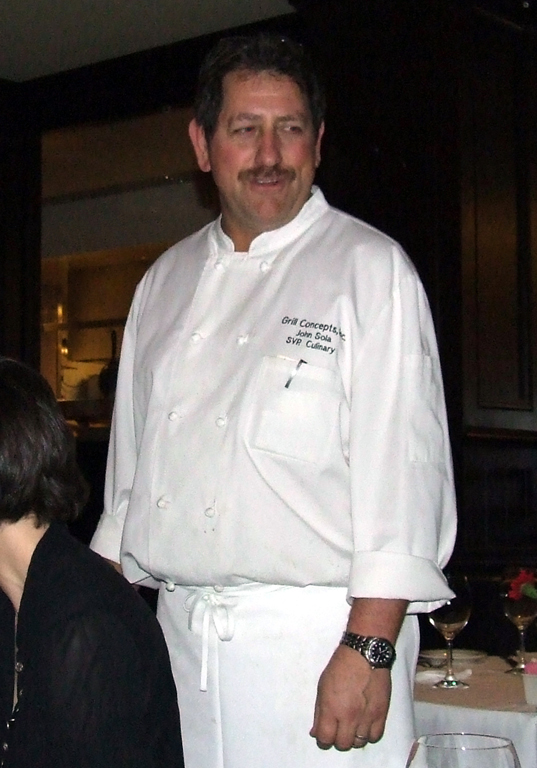 The manager had paired the liver with a 2006 Herzog Special Reserve Merlot, which fortunately didn't clash with the Bordelaise. If you were this liver would you eat yourself? This entry was posted in Trippy Food (Tasty flora and fauna), USA and tagged Bordelaise, CA, calf, Hollywood, liver, The Grill, veal. Bookmark the permalink. I can’t stand liver, and I try it hoping to like it every time someone makes it or orders it. It’s always mealy, and the after taste is terrible. I’ve had bad experiences with liver in the past (and I’m not referring to my partying days); I know the taste you’re referring to, where you pray the onions, mushrooms, peppers and anything else on hand will kill the taste. I was very pleasantly surprised here – this was like a cut of meat rather than a juvenillle cow’s organ. This is the liver you’re waiting to try. Liver let die. Great write up! Now, ferret livers, that’s something to think about! Not likely here in California since you can’t even keep them as pets. You can, however, buy guinea pigs at pet stores, and they roast up pretty nicely! As a matter of fact, when I had cuy in Brooklyn, they left the liver in it. Tasted like turkey liver…. So what was your take on the liver?